NJEA President Wendell Steinhauer and NJEA Lobbyist Sean Hadley discuss ESSA implementation with Joint Committee on Public Schools. 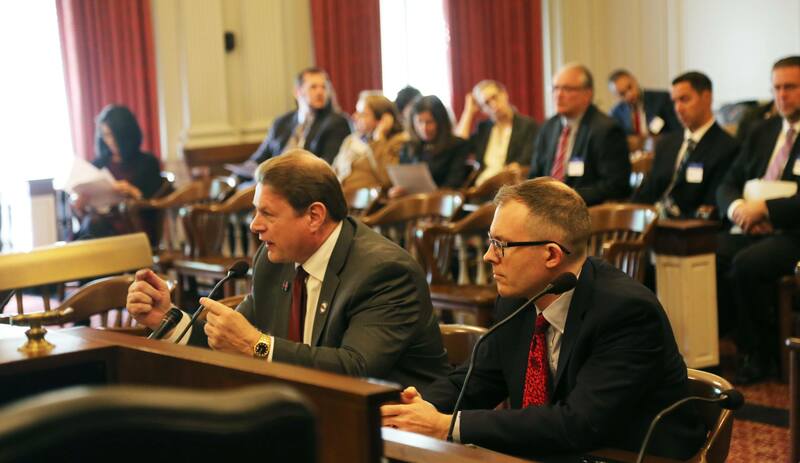 NJEA President Wendell Steinhauer testified before the Joint Committee on Public Schools today. As the committee seeks input on the implementation of the federal Every Student Succeeds Act (ESSA), Steinhauer took the opportunity to discuss issues that will have the most significant impact on educators and their daily lives in the classroom. ESSA brings potential relief from the “test and punish” mentality that has permeated schools throughout the 14-year tenure of No Child Left Behind (NCLB). Unlike NCLB, ESSA requires states to seek multiple measures as indicators for school success. While ESSA identifies four specific indicators to measure school effectiveness, it also requires each state to choose an additional indicator that would best meet the needs of the students who reside in the state. Under NCLB, the only indicator of school effectiveness was student performance on statewide standardized tests. ESSA de-emphasizes the role that statewide standardized tests play in schools. Steinhauer did not miss the chance to urge the Joint Committee to consider the implication of the new federal law as they influence the implementation of ESSA. Steinhauer further recommended that the committee implement new and innovative ways to support schools that need assistance. Rather than suggesting the traditional remedies of more funding and more oversight, Steinhauer recommended that the committee support the development of Community Schools. View Steinhauer’s full testimony here.